Updated Wednesday January 17, 2018 by Kitchener Sports Association. Generally, dinner meetings are held the third Tuesday of each month. (September, October, November, January, February, March, April, and May). Conflicts with the Kitchener Ranger schedule sometimes necessitate a change. Refer to Upcoming Meetings. There is often a special children's rate, for children aged 12 and under ordering off the kids' menu, of $10. 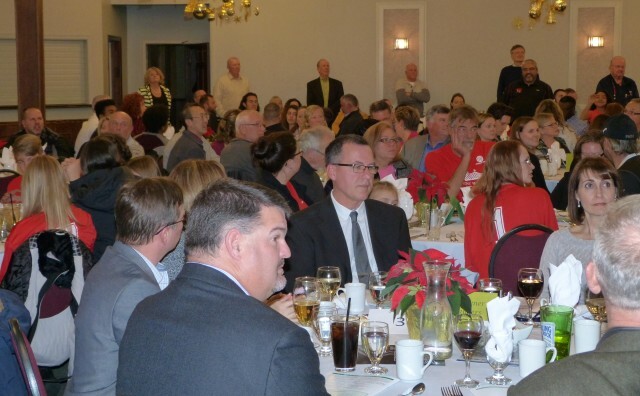 Special dinner events include: AGM Dinner in October, Volunteer Recognition Dinner in November, the Scholarship Dinner in April and the Athlete of the Year Dinner in May. 6:30 p.m. - Dinner - and program (guest speaker and/or presentations) immediately following dessert. All meetings are informal, dress is casual and you're invited!